DNC Software for Windows 10, Windows 8, 7, Vista and XP. Simple DNC Without the Bells and Whistles. 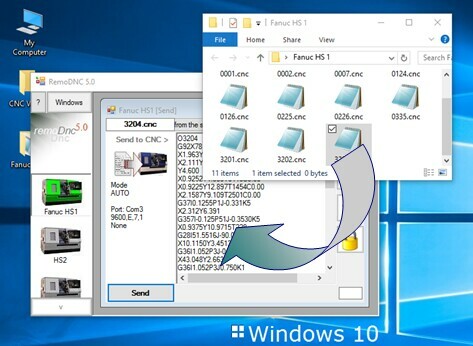 DNC Software, EasyDNC Remo version 5, is an easy to use DNC-to-CNC file transfer program specifically designed for modern versions of MS Windows. The DNC Software is still compatible with older 32bit versions of MS Windows - but on a 64 bit processor 'Remo DNC' runs in true 64bit mode making full use of the latest hardware and multi-core processors. EasyDNC Remo is Small enough to work on low powered tablets, laptops and older computers. But this version of EasyDnc is a modern, 64bit, multi-tasking 'MDI' (Multi Document Interface) DNC Program capable of serving a number of CNC machines at the same time. The DNC Program has big buttons making it ideal for use on Touch Enabled Displays and Windows Tablets. Use a finger to Drag and Drop file icons from Windows into EasyDNC without using a keyboard. What DNC are you looking for ? Or both? - Remo DNC Software is Small enough to work on low powered tablets, laptops and older computers. But this version of easyDnc is a modern, 64bit, multi-tasking 'MDI' (Multi Document Interface) DNC Program. It's still compatible with older 32bit versions of MS Windows - but on a 64 bit processor 'Remo DNC' runs in true 64bit mode making full use of the latest hardware and multi-core processors. EasyDNC Remo can manage dozens of separate CNC Profiles and switch instantly from one CNC to another or open more than one at the same time serving multiple CNC machines concurrently. 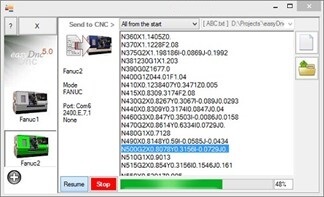 As well as quick and simple File-Transfer to and from cnc memory - the DNC Program can also Drip-Feed with Stop, Pause, Resume, Restart from any line, instant Rewind and even Single Step through individual lines of the CNC program. Auto Setup - RemoDNC also includes 'Auto Detect' options which can often setup your computer's DNC parameters automatically. DNC for older versions of Windows? The trial period is fully functional. No file size limits so you can test long DNC/Drip Feed processes. Download Now. EasyDNC is licenced to the computer - not the number of CNC Machines. There's also no annual or other periodic renewal or maintenance/support contract. Buy once, use forever. We don't bill you for updates every time Microsoft releases a new version of Windows. EasyDNC Remo is a true 64bit application created using the very latest software development tools. Compatible with the very latest 64bit Windows 10. But also downward compatible with older versions of Windows 8, 7 and XP. EasyDnc is now also available for Apple OS X. In many cases CNC operators can transfer files to and from the CNC without leaving the CNC console. No more running or shouting across the shop or crowding around the computer. Of course it would be great if you chose our DNC Application - but even if you're using somebody else's DNC Apps please bookmark this page and feel free to use the CNC Parameters below. An open service to the CNC Community. 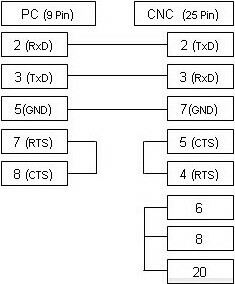 Cable shown here is the most common supporting xOn/xOff (DC1/DC3) flow control. 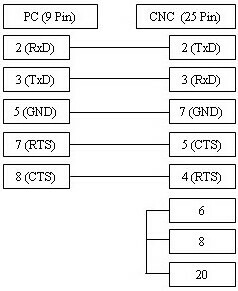 But if your CNC is configured to use RTS/CTS (Hardware) flow control then see the alternative cable diagram here.